The DoD awarded the the initial production run of the JTLV to OshKosh Defense. It seems to have produced a number of interesting remarks from outsiders who think OshKosh B'Gosh childrens clothing. This is a fine weapon and delivery system and not a child's toy. The image to the right I found using a Google search. I found it funny because of the tag on the front that says "No Photography". The vehicle looks very nice, and hopefully will perform as expected. The vehicle for me seems to have one visible flaw. The large undefended radiator grill in the front. I think that this needs to be covered more effectively, or moved to the top of the hood as much as possible. 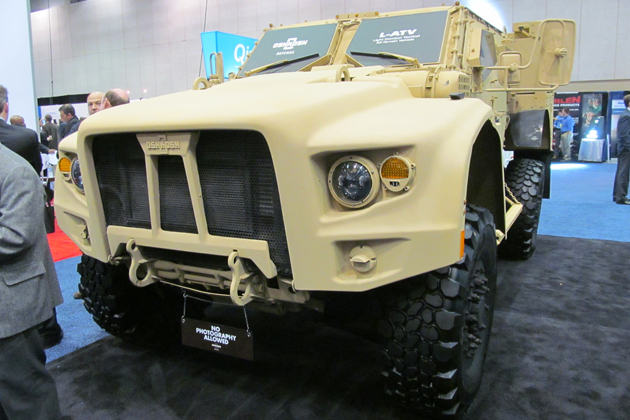 The initial cost per unit is roughly $300K which is more than a HUMMV, but considerably lower than MRAP. My expectation is that this vehicle helps protect our troops and bring them home safely at the end of the day. The price tag is not the defining issue here.